I had never even dreamed of releasing an album until people started asking me for my music after performances. I finally mustered the courage (and scrounged up some funds) to “Move Ahead” and give it a shot and in the end, the hard work paid off. I am very pleased with this album and couldn’t have asked for a better start. Producer Ryan Almario really brought my songs to life. In fact, I cried the first time I heard his ideas and glimpsed what my writing could really sound like when fleshed out. I had no idea what production and orchestration could do to turn my limited concept of “me and my piano” into something that really shined. But when he was done, my songs did, in fact, really shine and people noticed. Straight out of the gate, Love Knows the Way (track 5) received an honorable mention at the 2012 Posi-Music Awards in Orlando, FL that following spring. Move Ahead was my first big toe in the pond of recording and producing my original songs and sharing them with the world. But it won’t be my last! Over the last three years my vocals, songwriting and confidence have really begun to climb. And thankfully, I am already working on a second album of singer-songwriter style rock(“Eulogy”) and also a short album of jazz originals as well. 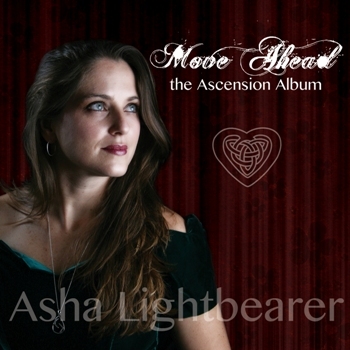 Asha Lightbearer makes a striking entrance into the new thought music world with her debut full-length album, Move Ahead. Asha has a sound unlike any other, combining a voice that is almost sweet with content that often addresses the woes of humanity. Imagine combining an angel with Alanis Morissette and you might come close to Asha Lightbearer. With a sound all her own, Asha takes her listeners on a journey of healing and exploration. From the first haunting notes of “Ethereal” to the closing chords of “Hallelujah (Ascension)”, Asha navigates through emotion, doubt, glory, love and triumph.